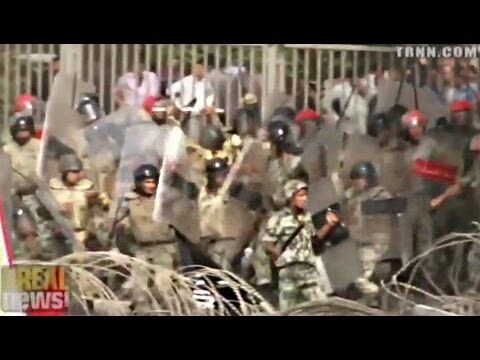 Egypt remains in a state of unrest after the ouster of democratically elected president Mohammed Morsi by the Egyptian military and a formation of a transition government that’s replaced it. We now go to Egypt for the latest. We’re joined by Mohammed ElMeshad. He’s a Cairo-based independent journalist who wrote for Egypt Independent for two years. He’s joining us now from Cairo. MOHAMED ELMESHAD, INDEPENDENT JOURNALIST: Hi, Jaisal. NOOR: So, Mohamed, let’s start with this news breaking on Monday that 22 members of the local Al Jazeera affiliate in Cairo resigned, claiming biased coverage. These are essentially the same claim that we saw in the WikiLeaks cable that was released a few years ago, where the State Department said that essentially Qatar was using Al Jazeera as an instrument of its own foreign policy. ELMESHAD: Well, yeah. I mean, this whole situation has been pretty–it’s been pretty interesting. You had 22 Jazeera reporters, like you said, they’re resigning claiming that they were reporting in a very biased way, in a very politically directed way. You had a bunch of reporters kicked out of a very important press conference where the Armed Forces were making some announcements after a bloody encounter with the pro-Morsi supporters. You have a privately owned anti-Morsi media that’s constantly attacking Al Jazeera for their coverage and for what they’re perceived to be as, which is a pro-Muslim Brotherhood, Qatari-sponsored, Qatari-sponsored, politically, media outlet. So Qatar in the past year was probably Egypt’s only donor from the Gulf countries, only major consistent donor from the Gulf countries, although many of the other Gulf countries refused to fund Egypt. So it’s shown that Qatar has been the most comfortable country with the Morsi leadership, and it indicates that perhaps there is some sort of alliance there. NOOR: Since Mohamed Morsi was ousted from power, other state Gulf states have stepped up and promised billions of dollars of aid to Egypt. Can you give us some more information about what’s happened? ELMESHAD: So far, Saudi Arabia and the United Arab Emirates have offered a combined $8 billion package. Kuwait has offered around $4 billion. Some of these things should be taken with a grain of salt, because since the 25 January revolution, there have been a lot of claims and a lot of kind of grand proclamations from the Gulf countries offering to help Egypt out financially. Of course, Egypt is going through a major deficit in its foreign reserves. There was a recent fuel–petroleum shortage, and we had kind of an energy crisis going on. As we well know, the Gulf countries have oil in abundance and are able to provide energy at very low costs. So there’s a lot to be played with on the political economy of Egypt. [incompr.] that Qatar were the only main donors. Saudi and the UAE, as well as Kuwait, have a historic enmity with the Muslim Brotherhood. I mean, Saudi Arabia back in the late ’80s and early ’90s, when the shift was going from having a large batch of Egyptian low-skilled neighbors to a sort of South Asian–they actually, like, shifted the focus on where they were marketing their needs for unskilled labor for their reconstruction projects, there was a concerted effort against bringing in more Egyptians. And many people think it’s because of the increasing political influence of Egyptians vis-à-vis the Muslim Brotherhood’s activities in the Gulf. Just over the past year since Morsi took power, and even before then, Dahi Khalfan, chief of police in Dubai, has been Tweeting–I mean, he’s been Tweeting insidious Tweets against the Muslim Brotherhood, claiming that they’re a terrorist organization, claiming that they’re going to harm Egypt in incredible ways. And many people thought that Dahi Khalfan would not be allowed to tweet in such a way without having the kind of–at least consent of the Emirati authorities and Emirati royal family, because it did cause a mini political crisis between the countries. So what’s going to happen over the next year, over the next few months will be very interesting to see whether or not Qatar has been ambiguous over how it perceives this last change. I mean, the emir of Qatar, the new, young emir of Qatar says that he respects the rule of the people and congratulated Egypt’s new leadership. But, of course, it’ll all show when it comes time to put down the money, so to speak, which is the main way of showing allegiance to Egypt in these days when our economy has been in a shaky position for so long. NOOR: And it goes without saying that the economy was the main reason that millions of people came into the streets, the economy and the instability caused by the economy in decline. ELMESHAD: Of course. I mean, what’s–we had a week-long extreme fuel crisis. I waited four hours in line to get half a tank of gas at one point. Of course what was very curious to many people is that almost immediately after Morsi’s ouster, the gas crisis had disappeared. So it gave credence to some speculation, especially on the Muslim Brotherhood front, that maybe this was a created crisis to try and increase the discomfort. Many people were speculative over whether or not Morsi had actual control over a lot of the government organizations, including the Ministry of Petroleum and the Ministry of Interior. But the–well, the Ministry of Supply many people say is under Morsi’s–was under Morsi’s authority. But many wondered whether or not these were sort of played-out crises in order to increase the sense of public disapproval of Morsi. But yes, the economy has been on the fence for a while, and many are very, very worried. Foreign reserves have been depleting. They were supposed to have actually disappeared [incompr.] we got a few loans from the U.S. and the E.U. And the economy will be the main factor over the coming period. NOOR: So Syrian President Bashar al-Assad has said this military coup in Egypt means the end of political Islam in the Middle East. The transition government has on one hand reached out to the leadership of the Muslim Brotherhood. On the other hand, the military’s rounded up some of its leadership. I believe Mohammed Morsi remains in prison right now. Is there a sense what the next move will be for the Muslim Brotherhood? Obviously, they still enjoy large support in Egypt. Is there a sense of whether they may go underground, or perhaps if the Nour party, the Salafist party, some of the Muslim Brotherhood supporters may switch over to them as an option? Or are they not seen as an option or as a replacement for the Muslim Brotherhood? ELMESHAD: No, the Nour party definitely is not seen as a replacement for the Muslim Brotherhood. I think maybe they see themselves as that. But the Nour party is–their religious backing is more Salafist, more Saudi-oriented, more Wahhabist, I guess, oriented. Maybe not–maybe Wahhabist is a bit too extreme, but they’re more–they’re much more orthodox and they’re not completely in tune with the Muslim Brotherhood from a jurisprudence perspective. The Muslim Brotherhood still has a very strong following. Let’s not forget they had their system of hierarchy and sort of group thought is very well entrenched. And if you just go visit their sit-ins in [rabada’doja], their main sort of protest sit-in, you’ll see that they’re still–I mean, they haven’t lost faith in their own cause. Bashar al-Assad–and probably I guess this is one way to tie it in with the Saudi-Emirati perspective is political Islam has been the only form of opposition that the dictators of the Arab world have not really been able to quell, I mean, because they can’t do any–they can’t shut down the mosques, more or less, and political Islam was an outlet for a lot of people who couldn’t find any avenues, any way to express their dismay with what was going on. So–and another way to look at the Saudi, Emirati, Kuwaiti perspective on the Muslim Brotherhood is that they are very traditionalist, they are very anti-change, whereas Qatar, which has already–which is the only Gulf country in recent history to see kind of a silent coup or a takeover of power when the last Qatari emir took over power from his father, kind of more or less ousting him peacefully, it’s more accepting of change. The Muslim Brotherhood, their next steps–I mean, they’re still on the streets. There’s going to be a protest tomorrow. We’ll have to wait and see what’s going on. I’ve heard from a lot of insiders rumors that there may be clashes tomorrow. Friday is always a big day for protesting. You know, of any day of the week, Friday is the day to watch out for. So this is the first Friday after the clashes where 80–the assumed members of the Muslim Brotherhood were killed or died. So tomorrow’s–tomorrow will be a big flashpoint. As for the leadership of the Muslim Brotherhood, like you said, Morsi, according to his son, is still being kept in the Presidential Guard. There’s a call out for most or all of the vocal Muslim Brotherhood leaders of anytime they ever said anything insinuating the use of violence. That’s being used in court claims and subpoenas for their arrest. NOOR: And finally, what is the perception of the U.S. role in what’s happening in Egypt right now? Al Jazeera just had a piece talking about how they’ve uncovered a U.S. money trail to Egypt groups that press for Morsi’s removal, and they’ve also just transferred–I think it was four fighter jets to the Egyptian military, along with the billions of dollars of aid they give every year. And significantly, the U.S. government has not called the Egyptian military’s removal of Morsi from power a coup. ELMESHAD: One really interesting thing. You know, I’ve been at both protests. I’ve spent a lot of time with members of each. And one thing you’ll inevitably hear in each protest if you spend enough time there is these guys are working for the U.S., these guys are the U.S. puppets playing agents of the U.S.’s (sorry) plans for the region. Either the Muslim Brotherhood’s leadership shot themselves in the foot when, after the military gave their ultimatum to Morsi, they all said, well, we don’t think the U.S. will stand for that, and we hope the U.S. will be on our side, which is kind of incriminating if you’re trying to distance yourself as much as possible from the U.S. When I passed by the pro-Morsi camp today, the sit-in, and almost with every speaker on their main sort of stage they would talk about how the other side is being funded by the U.S., whether it’s due to their desire to hegemonize the region or due to an anti-Islamist agenda or perspective. So the perception will always be you cannot win if the U.S. is on your side or if the U.S. is perceived to be on your side. The military, when they were in power during the Supreme Council of the Armed Forces, have been able to suppress a few civil society groups in Egypt by digging out their paper trails to the U.S. At the same time, the military are or have been perceived to be probably the closest Egyptian governmental organization to the U.S. Our generals are always in the U.S. It’s known that they’re friends with the Joint Chiefs of Staff. Usually they’re on a first-name basis with people like John McCain and John Kerry. And they’re reliant on U.S. military aid, whether its technical or liquid. So the perception is there. However, you know, the U.S. refusing to call it a coup kind of makes it clear that this alliance or the alliance with the military continues, because as Obama said, if they acknowledge it’s a coup, that would mean that they’d have to cut aid to Egypt, because they can’t justify it to Congress anymore. And if they cut aid to Egypt, to the Egyptian military and to Egypt in general, that means U.S. loses Egypt as a key ally in the region, which of course it needs due to its geopolitical significance, especially near Israel and the Suez Canal. NOOR: Thank you, Mohamed ElMeshad. We appreciate your ongoing reporting from Cairo.